THE diversity in halal certification makes it difficult for companies to do cross border trading. 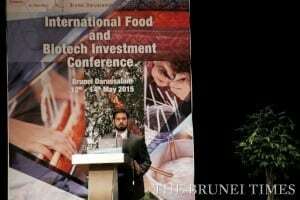 In an interview with The Brunei Times, Mustafa Adil, head of research and product development for Islamic finance at global intelligence firm Thomson Reuters, believed that the biggest bottleneck to the growth of Islamic economies like Brunei involves whether or not a certification for Syariah-compliant products is accepted across markets. He said some food manufacturers are frustrated in having to obtain separate halal certification to be able to export in different countries. “That becomes the biggest hindrance (to companies that want to export),” he said. Certification is also an ongoing issue for local Brunei companies wishing to export. In early March, Legislative Council Member YB Dato Paduka Hj Abdullah Hj Mohd Jaafar noted that other than MABIMS (Informal Meeting of Religious Ministries of Brunei, Indonesia, Malaysia and Singapore) countries, the Brunei halal certificate isn’t recognised in other countries. The LegCo Member said obtaining recognition of the certificate will help the Brunei halal industry to expand overseas as this will allow local companies to export products to more countries. Mustafa said that if a single set of rules can be created, implemented and accepted in different markets, it will help companies export Syariah-compliant products in several countries. “This would help expand the market and would allow companies to achieve economies of scale,” he said. This would also help smaller companies compete with those in the more developed market. Mustafa said that they are starting to see Islamic economic hubs like Malaysia and the United Arab Emirates accepting goods that are certified in other markets rather than having re-certified. Being said, there is still a long way to go for a “single certification” and recognition of certifications across market. Thomson Reuters defined the Islamic economy as core sectors and its associated eco-system that are structurally affected by Islamic value-driven consumer lifestyle and business practices. The Islamic economy has seven sectors: food, finance, clothing, travel, media/recreation, pharmaceuticals and cosmetics. Mustafa said in a forum held last month that Brunei has a significant potential to grow as an Islamic economy, being one of the top 15 countries in Thomson Reuters Global Islamic Economy Index. Brunei scored 33.3 in the overall index score. In comparison, Indonesia scored 33.8, Saudi Arabia 46.6 and the top scorer is Malaysia, which scored 111.5 and led significantly in many of the sub-indicators. The second highest is the United Arab Emirates at 71.6 and the third is Bahrain at 64.8.